Everyone loves a birthday party! It’s the perfect occasion for a big ol’ celebration cake. 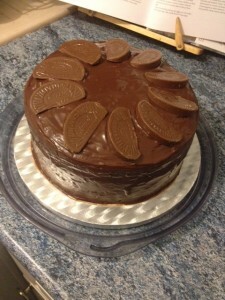 So for the Bolton Clandestine Cake Club’s Second birthday event I wanted to make something a little special. 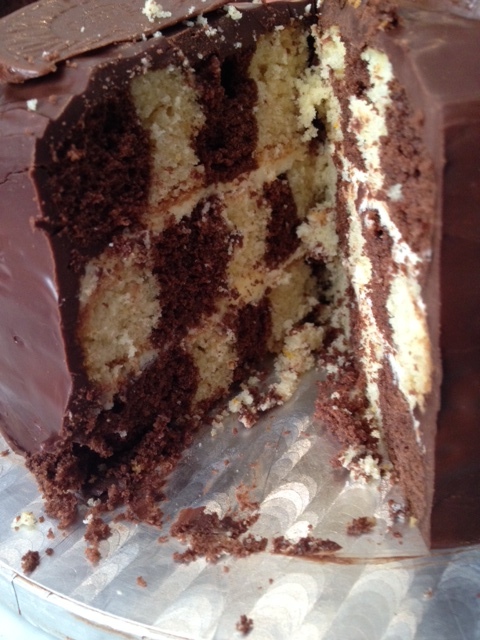 I love a cake with a secret hidden pattern, and having made a chocolate & vanilla chess cake once before, it seemed the perfect opportunity to do one again. This time, I wanted to try something different with the flavour combination, chocolate orange is a match made in heaven, so I figured, why not? I free styled slightly with the recipe, using the base sponge recipe and chocolate ganache to coat the cake from the GBBO Showstoppers Recipe book for their Chess cake, however I adapted the recipe slightly by adding orange zest & extract to the plain cake mix, and using an orange butter cream to sandwich the sponges. I was very pleased with the results, there was a lovely balance of the chocolate and orange flavour which is what I was hoping for. The recipe may seem really involved and long winded, but it’s actually much simpler than it seems (I promise!). Definitely worth having a full read through and get yourself familiar with the steps before you begin though. 1. Preheat the oven to 180 degrees C/350 degrees F/Gas mark 4. Put the butter into a large mixing bowl or free-standing mixer. Beat until very creamy. Gradually beat in the sugar, then the vanilla extract. Keep beating and scraping down the sides of the bowl, until the mixture is much lighter in colour and very fluffy in texture. 2. Gradually add the eggs, a tablespoon at a time, beating well after each addition. Add 1 tablespoon of the weighed flour with each of the last 2 portions of egg to prevent the mixture from curdling. 3. Sift the remaining flour and the salt into the bowl and gently fold in using a large metal spoon until you can no longer see any streaks or specks of flour. 4. At this point you need to split the mixture. I do this by weighing the full quantity and transferring half to another bowl. Sift the cocoa into one of the bowls and add 2 tablespoons of the milk. Fold in until completely blended. Spoon the mixture into one of the piping bags. Add the orange extract and orange zest and 2 tablespoons of milk into the mixture in the second bowl, mix thoroughly, then spoon into the other piping bag. 5. Pipe a ring of chocolate mixture around the inside edge of one tin. Then pipe a ring of the light mixture inside the chocolate ring. Repeat with alternate chocolate & light rings until the tin is filled. Repeat with a second tin. Then for the third tin, start with an outer ring of the light mixture, so this tin is the reverse of the other 2 tins. 6. 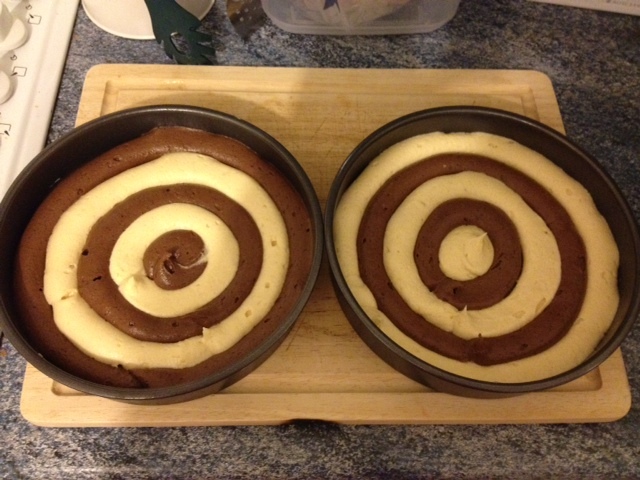 Bake for 22-25 minutes until well risen and springy when lightly pressed in the centre. Run a knife around the inside of each tin to loosen the sponge, then turn out onto a wire rack and leave to cool completely. 7. Whilst the sponges are in the oven/cooling you should make the butter cream filling and the chocolate ganache. To make the orange butter cream beat together the icing sugar, butter and orange zest with an electric mixer (free-standing or handheld), on a medium-slow speed until the mixture comes together and is well mixed. Turn the mixer down to a slower speed. Slowly add the milk a little at a time (you may not need all the milk to get the consistency you’re after so don’t worry if you don’t add it all). Continue beating until the frosting is light and fluffy, at least 5 minutes. 8. To make the ganache, put the finely chopped chocolate into a heatproof bowl. Heat the cream in a pan until hot but not boiling, then pour in a slow, steady stream over the chopped chocolate. Leave it to stand for a few minutes without touching it, then stir gently until the chocolate is all melted and smooth and glossy. Leave to cool and thicken slightly, then stir gently, but don’t over beat or the mixture could separate. It’s best to leave the mixture to cool somewhere for a while before trying to cover the cake, otherwise the consistency will be too runny to hold over the cake. I usually leave for at least 20 minutes. 9. Once the sponges are fully cooled it’s time to assemble the layers. Place one of the sponges with the chocolate outer ring upside down on a cake board or your serving platter. Spread the top with half of the orange butter cream then set the the sponge with the white outer ring on top. Spread the rest of the butter cream on top and then top with the third remaining sponge with the browned top uppermost. Cover the top and the sides of the cake with the chocolate ganache. I use a palette knife to smooth out the ganache on the sides of the cake. I find it best to do one layer first to get the coverage over the cake and then when that has set slightly to go over with a second layer over the top. The ganache should have a lovely shiny finish. Before the ganache has had chance to set on the top, use the Terry’s Chocolate Orange segments (or whatever you have chosen to decorate the cake with) to decorate the top. Leave the cake in a cool spot (not the fridge though) to set. I tend to make the cake the evening before I want it so the ganache has overnight to set. Et voila! It’s a very impressive looking cake on the outside with the beautiful glossy ganache finish. It becomes even more impressive when you slice into it. 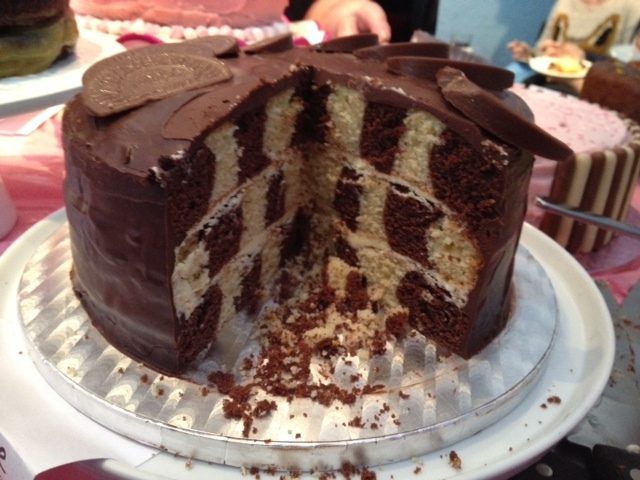 It can be a little nerve wracking as to whether the chess board pattern will have worked, and you won’t know until you cut into it, however I can guarantee you that it will draw some ‘oooh’s’ and ‘aaaaah’s’ when the cake is sliced! Hidden patterns within a cake always get a great reaction, and the method for creating such an impact is actually pretty simple, so why not give it a go?! This entry was posted in Baking, Dessert, Recipe by Jen. Bookmark the permalink. It looked and tasted fabulous!